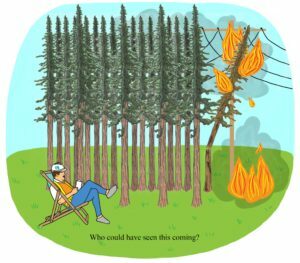 If a tree falls in a forest and no one is around to see it land on a power line, can it still catch fire? Obviously, yes. Given, however, that Cal Fire faulted Pacific Gas & Electric (PG&E) for at least a dozen of the fires that devastated Northern California a year ago, the obvious seems to bear repeating. Among the fires started by PG&E are the Redwood and Atlas fires in Mendocino and Napa counties, respectively, which killed a total of 15 people and burned over 87,000 acres of land in 2017. The other 10 fires caused by PG&E collectively claimed 29 lives. The total amount of damages from the dozen fires faulted to PG&E totals over $2.5 billion. PG&E is supposed to maintain a safe tree line around its electrical infrastructure. It’s state law. The falling of mere branches starting lethal wildfires can only be explained by a failure of upkeep. Cal Fire’s referral of at least eight of these at-fault cases to the local prosecutors’ offices speaks volumes. These referrals suggest prosecutors may recommend filing criminal charges against PG&E. On top of this, PG&E has demonstrated an unwillingness to improve upon its past failings — the 2018 Irving Fire in Marin County started when a power pole collapsed. Once again, an apparent failure of upkeep. PG&E, unsurprisingly, faces in excess of 200 lawsuits over the destruction wrought by the fires. This is where Senate Bill 901, signed by Gov. Jerry Brown on Sept. 21, comes into play. Among its provisions, SB 901 relaxes liability standards for utility companies that have committed safety violations and allows PG&E to pay for damages from the lawsuits it’s facing with state-authorized bonds. The bonds shift the financial responsibility for PG&E’s failed maintenance onto the taxpayers — the very people who were harmed. It must be noted that SB 901 does, commendably, contain provisions intended to prevent wildfires, such as clearing thousands of acres of dried, flammable plant matter and implementing stricter safety standards for utility companies operating in areas with a high fire risk. However, these sensible legislative remedies shouldn’t be chained to PG&E’s bailout. Unfortunately, the provisions total to $1 billion in state spending over five years. PG&E, by all accounts, seems to be failing in its duty to maintain its infrastructure to state safety standards, and yet the legislature sticks taxpayers with the bill for both current damages and preventative measures. For its contribution to fire safety going forward, PG&E has opted to shut off power when areas are reported with high fire risk. PG&E did so after a high-wind warning last week, leaving tens of thousands of Northern Californians without power. This is a quintessential example of taking one’s ball and going home. Instead of bothering to undertake regular safety maintenance, PG&E has decided it’s safer to deny service to its customers. This is unconscionable and a non-solution to a problem that needs to be addressed. PG&E should be held financially accountable for its failure to adequately maintain its infrastructure and the resulting deaths and damages. While state senators and assembly members who support the bill argue failure to bail out PG&E would ultimately lead to higher costs for consumers, this argument is a mere refrain of the “too big to fail” rhetoric of the 2008 financial bailout. Public utilities are structurally anti-competitive due to the prohibitive initial investment required to lay infrastructure, and PG&E essentially has a monopoly in California. It provides electricity and gas to almost the entirety of Northern California, and its service map extends as far south as Santa Barbara County. PG&E has in effect utilized its monopolistic hold on the state to bully the government into socializing its losses. As demonstrated by the Atlas and Redwood fires, its lazy maintenance of its infrastructure is a matter of life and death. This election season, let your state assembly member and state senator candidates know your vote is contingent on their supporting an amendment to SB 901 repealing the bailout and reinstating previous liability standards.